Sing da Navelli dreams of singing the lead role of her favorite opera, Angelique. When she enrolls at the prestigious Dunhammond Conservatory, Sing is immersed into the strange history of the school and the peculiar mythology surrounding Angelique’s origins. A strange magic lurks in the woods surrounding Dunhammond, permeating the school and the music that is created there, and Sing is about to discover the great lengths she will go to in order to create music. Strange Sweet Song is a profoundly beautiful and magical debut. 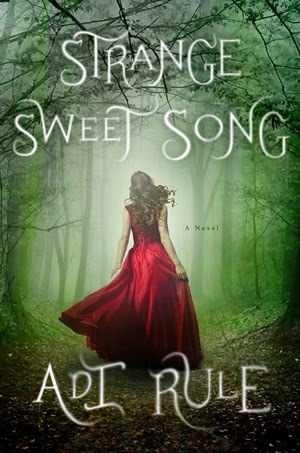 Rule artfully tells two stories in this novel: The first is Sing’s exploration of Dunhammond, her search for what is missing in her voice, and her resistance in becoming like her dead mother. The second story is wider in scope—it tells the mythic, centuries-old story of the beast in the woods surrounding Dunhammond, a tale imbued with strange magic and tragic consequences. The stakes are high in this novel, requiring deep despair for any magic to occur, and the emotions are just as intense as the music that moves the universe of Rule’s story. Rule’s writing is musical and emotionally engaging, and the story breathtaking. This is a standalone novel you do not want to miss. Cover Comments: I love the deep green of the background and woods--perfect considering that the woods surrounding the conservatory are so mysterious and so important to the story. And I really like how the title is displayed--very ethereal.